Resplendent with charm, the outlying communities that make up the Telluride region have a personality all their own. At least 45 minutes from Telluride, these amiable towns offer an alternative to the hustle and bustle of Telluride. 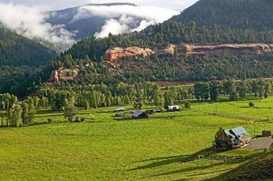 While the communities of Dolores, Rico, Norwood, Ridgway, and Ouray present more budget friendly real estate options than Telluride – they still feature beautiful mountain views, convenient river access, newly constructed homes and sprawling ranches.